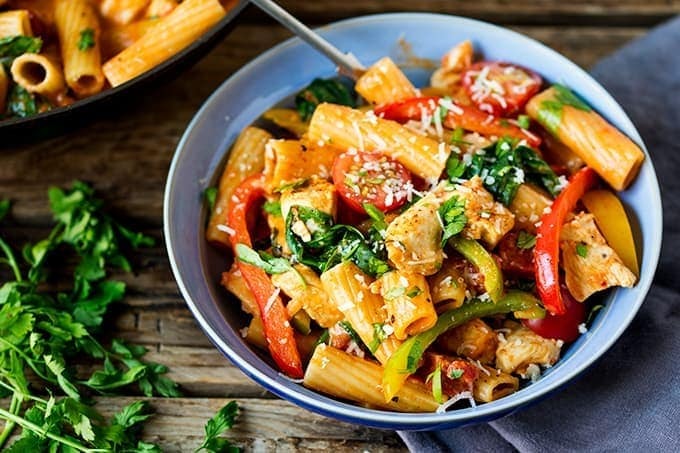 This Super quick and easy Cajun chicken pasta one-pot is a winner for the family dinner table. 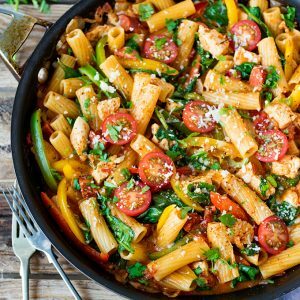 Cajun spiced chicken in a creamy tomato sauce – with pasta and extra veg. 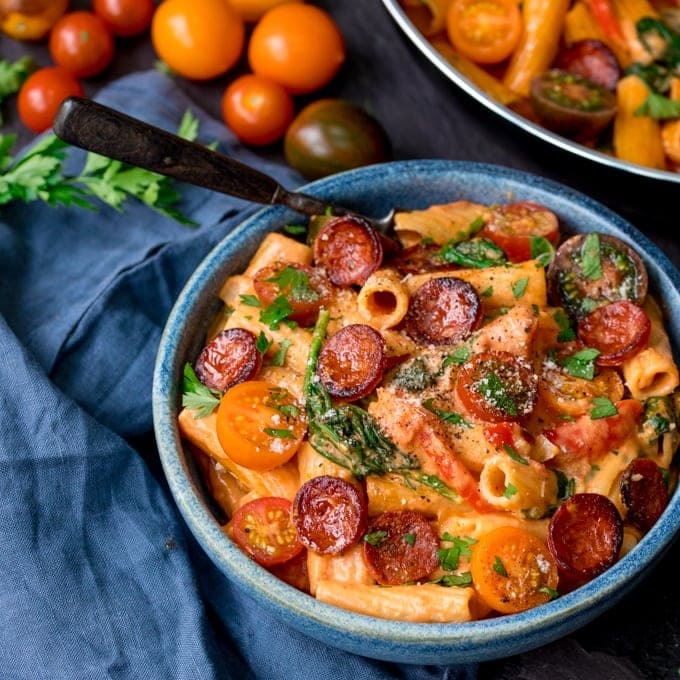 One pot dinners – I LOVE them! Especially speedy pasta versions. Perfect for getting dinner on the table before the kids start having an after-school hunger meltdown! 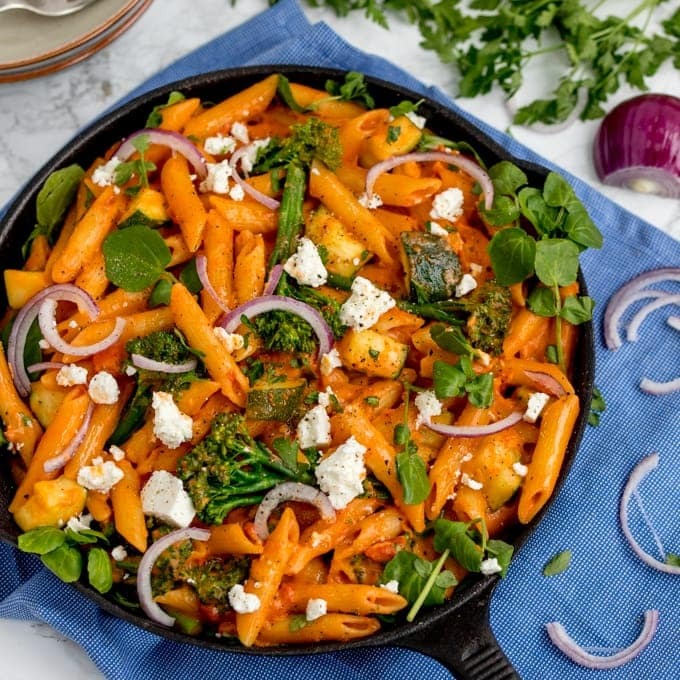 All cooked in one pan and on the table in 35 minutes, it makes a great mid-week dinner. I do love a good one pot dinner. 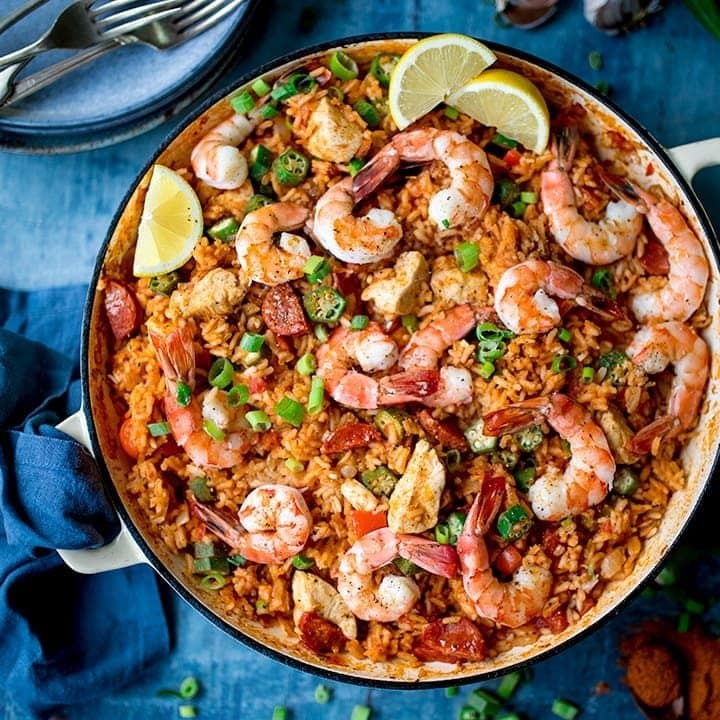 I think I’ve made at least 12 one-pot meals of some sort on the blog so far. 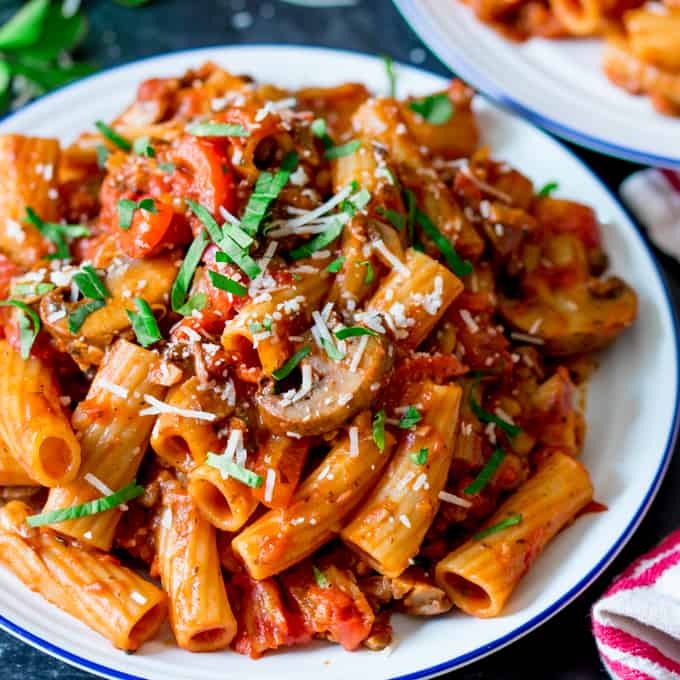 Some pasta – like this rigatoni alfredo, or this garlic chicken pasta, some non-pasta – like this one-pan English breakfast or this Greek lamb and potato tray. Definitely more to come!! This quick Cajun chicken one-pot is a winner for the family dinner table. 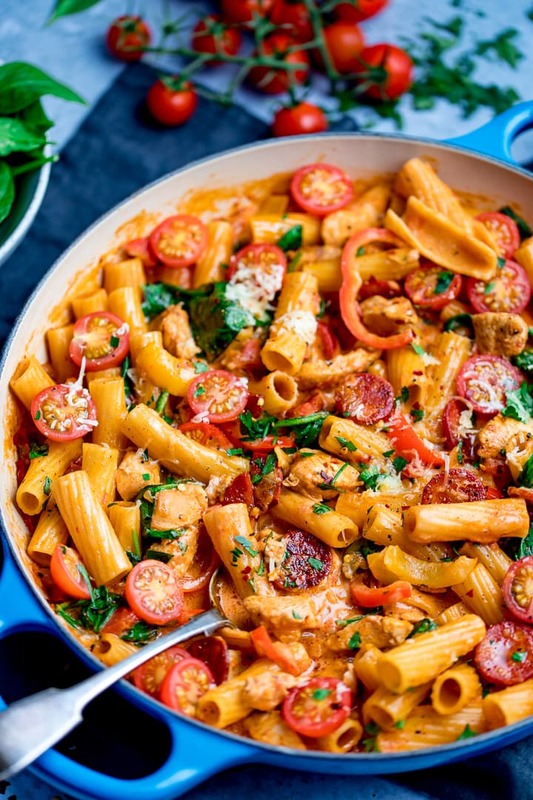 Cajun spiced chicken in a creamy tomato sauce – with pasta and extra veg. Heat the oil in a large frying pan (skillet) and add the onion. Cook on a medium heat for 5 minutes, stirring occasionally, until the onion begins to soften. Sprinkle the Cajun seasoning on the chopped chicken breast, then add to the pan with the onion. Heat for 5-6 minutes until the chicken is sealed on all sides. Add in the chorizo and garlic and fry for a further two minutes, until the chorizo starts to release it’s oils, then add peppers. Stir, then add the pasta shapes, tin of tomatoes and chicken stock. Bring to the boil, stir, then place a lid or some foil over the pan. Turn the heat down and let the pasta simmer for 15 minutes. Check and stir once or twice during this time. After 15 minutes, remove the lid and test the pasta. It should be just cooked (if it isn’t, cook for a couple of minutes more with a splash of boiling water if needed). Stir in the cream, heat through for a minute then turn off the heat and stir in the spinach. It should wilt very quickly. Sprinkle on the sliced tomatoes, grated cheese and parsley, then serve. If you like the Cajun flavours in this dish then why not try my Cajun Chicken Salad with Coriander lime rice or my Cajun Chicken Noodle Salad. This is so good. Made it 3 times now in 3 weeks. Omgggg this looks sooo good! !